I took a short break in Jeff City, long enough to eat a Clif Bar and a couple granola bars, then hopped on my bike and headed back toward Columbia. 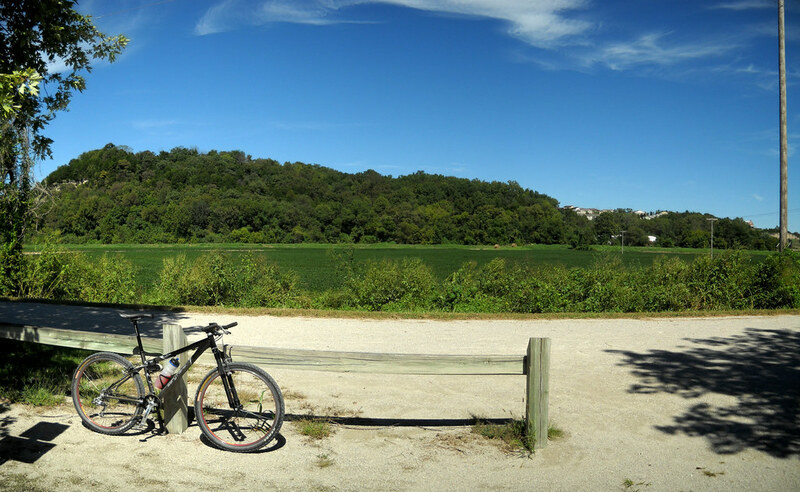 At some point, perhaps around Hartsburg, MO, I got the idea that I should ride all the way to Rocheport, making the trip just short of 100 miles. It seemed like a bad idea at the time, but because I’m stupid, I did it anyway. Just north of McBaine, I got a flat front tire, so I stopped on the Grocery Branch bridge to put in a new tube. About a half-mile later, I stopped at Katfish Katy’s to grab a 16oz Gatorade, guzzled it, then made great time to Rocheport. I later discovered that my speed was so high because the wind was blowing from the south. 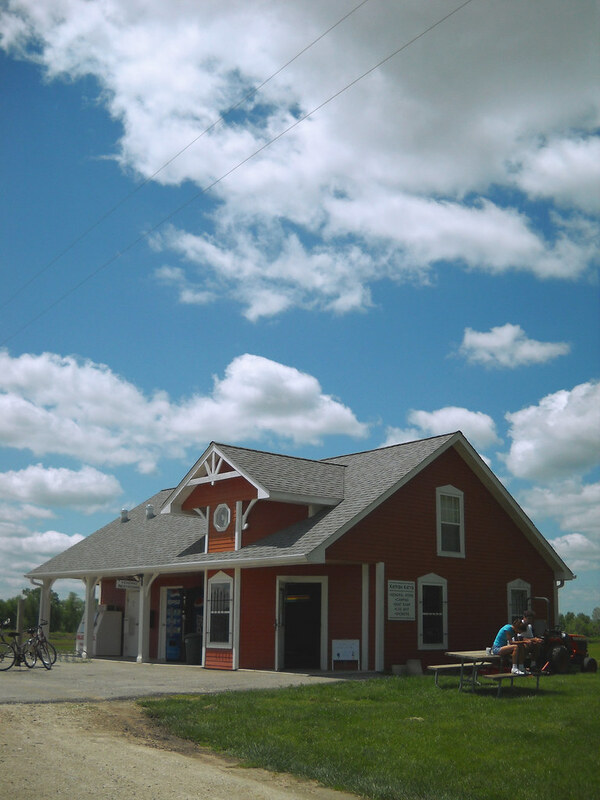 I grabbed a Snickers bar in Rocheport, topped off my front tire, then headed back to Columbia against the wind. Once in Columbia, I had to side-track on the MU Fitness Trail, taking it all the way to Old 63, then backtracking to the MKT before heading back to MU. Even with all the extra riding, I still only had 98 miles behind me when I got back to campus, so I had to loop around dowtown for a couple miles before I got to my car. 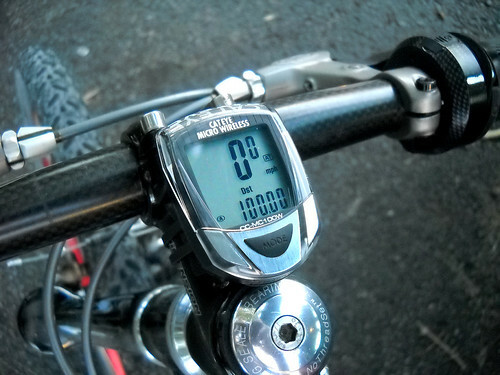 In all, it took me 6hr, 18min, and I did exactly 100.00 miles. My trip to St. Charles should be about 4mi longer, but I know I can do it now. It also won’t require backtracking, and I’ll get the chance to see plenty of cornfields and small dirt towns that I’ve never seen before. — Between Scott Blvd. 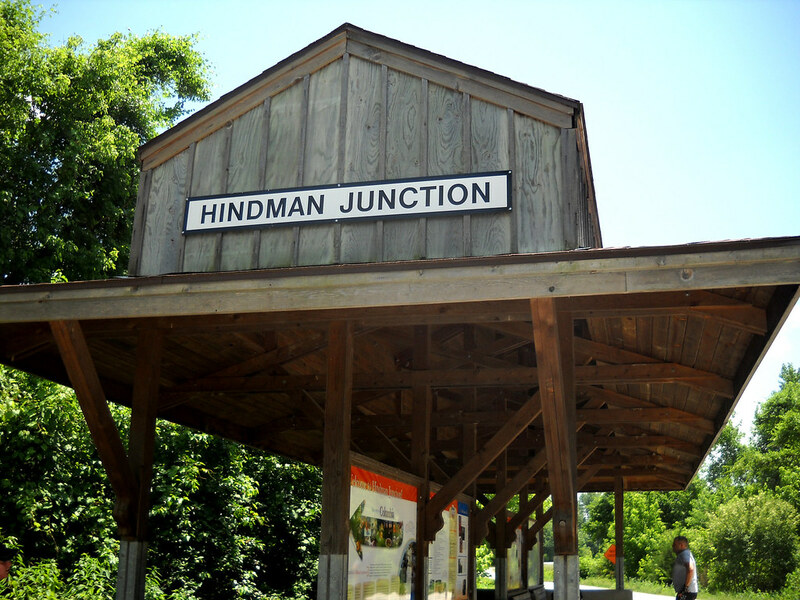 in Columbia, and Hindman Junction in McBaine, I got behind a family of riders on a 3-person tandem, with a 4th child rider connected via a tag-along hitch hiker bike, plus a 5th rider–an older teen–riding a separate bike right behind them. I slipped into their airstream, and we all did well over 20mph for a while. Unfortunately, they headed north when I headed south, so I didn’t get to cheat for as long as I would have liked. — Just south of Easley, my gears suddenly ghost shifted a couple times. I looked down to find a butterfly had met an untimely death between my chain and the 13T cog. I had to stop and dig it out with a stick. 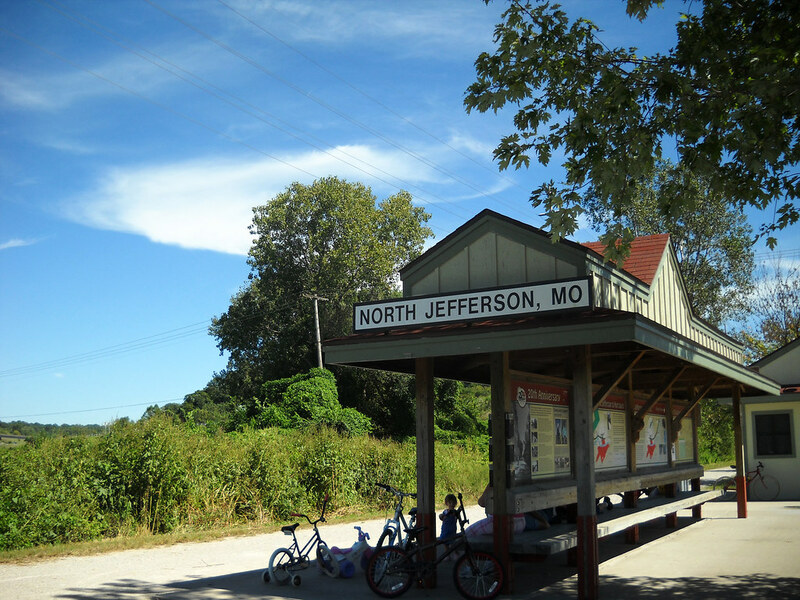 — Stopping in Hartsburg to take a few photos. I’ve passed it a few other times, but this was my first time that I had a decent camera with me. — A little girl in Jeff City told me I had a cool bike. I agreed. — Taking photos of an out-of-place Plymouth Prowler in Easley, MO. Navy body with a matching navy top. — Running into a Lexus SUV just north of Easley. A couple in their 60s had apparently gotten onto the trail somewhere, and just kept driving straight, since there’s nowhere to turn around. I have a feeling they were well into their trip down the trail before they realized they’d made a wrong turn. — Flat tire in McBaine. More of a time waster than a highlight. — Talked to the bike rental guy in Rocheport while I topped off my front tire. He was telling me about his brother, who rode from St. Charles to Jeff City, then did the return ride two days later, all on a fixed gear mountain bike. Overall, it was a fun ride. My new Selle Italia Signo T1 saddle did a decent job, although I may have to work on the angle a little. My legs were painfully sore after my 10-minute car ride home, but I’m doing better today. I’ll be keeping my ride time to a minimum for the next couple weeks to make sure I’m in good shape for the St. Charles trip. It’s good to know I’ll have it in me to make the trip, and it’s also nice that I can do 100 miles just on a whim. Photos from the ride are below, or check out larger versions on Flickr.